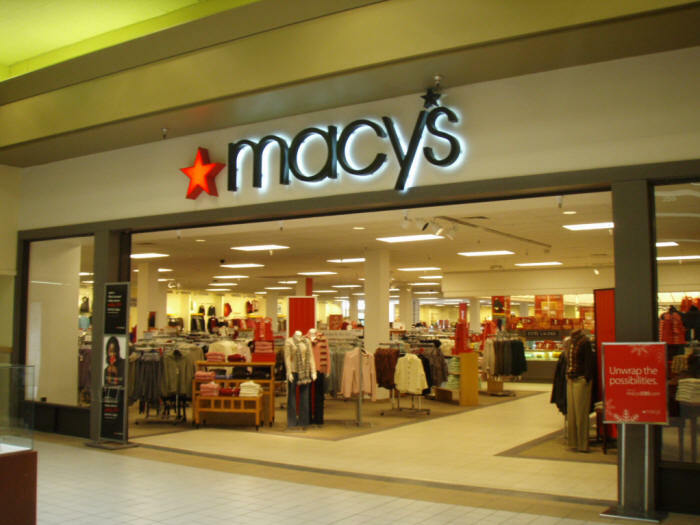 Macy's is a well known department store chain based out of New York, United States. The publicly traded company sells clothing and homewares from over 770 locations in the US, as well as online at Macys.com. Here customers can make great savings on their purchases by using special Macy's coupons, a list of which we keep up to date here at Coupofy. You can also use a Macys printable coupon if you prefer to shop in store. The company traces its roots all the way back to 1858 when Rowland Hussey Macy who had owned dry goods stores in the past, opened up a location on Sixth Avenue. The location proved successful as it was further North than the competition, and he was soon able to expand. It was one of the first stores to offer a money back guarantee and to offer made-to-measure clothing. The star logo which is now synonymous with Macy's was taken from a tattoo Rowland had done as a teenager. In the decades that followed Macy's became a household American name and has since positioned itself in the mid-range level. Not luxury, but not discount either. Today Jeffrey Gennette serves as President, while Terry J. Lundgren is CEO. The company is operated through the parent holding company Macy's Inc, which also owns Bloomingdale's. Collectively they report over $27 billion in yearly revenue, with over 170,000 employees. 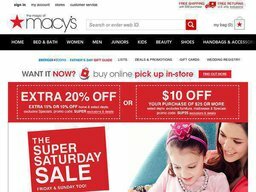 Macy's range covers Clothing, Shoes and Accessories; for Men, Women and Children. There is also Watches, Jewelry and Accessories; as well as Home Furnishings & Decor, Bed & Bath products, and a wide range of other everyday items. They stocks thousands of individual items from hundreds of different well known brands. The online store is very easy to use, allowing you to browse via the above categories and many other subcategories. You can also use the search bar if you have something specific in mind. Product listings can easily by refined by price range, size, features, color, brands, and many other parameters, and there are helpful user reviews and ratings to aid your decision. If you're looking for a bargain the Deals & Promotions page is just for you, but don't forget you make even more savings by using one of our Macy's coupon codes. If you're shopping for gifts, you may want to consider a gift card which will allow the recipient to make their own purchasing choices. There is also a Wedding Registry service which allows you to list products you'd like your wedding guests to contribute to. The core website caters to US customers but they also ship internationally if you select your flag from the icon at the bottom of the page. Macy's allows you to pay for your orders using most common credit cards, including Visa, Mastercard, and American Express; as well as their own Macy's credit card, which you can apply for and manage online. You can also use their own branded gift cards which can be redeemed for all or part of your order, the rest charged to your credit card. If you wish to redeem a Macy's coupon code all you have to do is enter it in to the promotional box, which you'll see just before the payment step during checkout. Standard shipping within the United States will take between 3 and 6 business days. You can currently use special Macy's coupons to get free shipping if you spend more than $99, though this offer is likely to change in the future. You can also pay extra for faster options. Expedited shipping takes 2 business days, while Express is a next day service. The cost of these methods is determined by the total value of your order. In some cases you can also pay for same day delivery. You can also have items delivered for free to your local Macy's store for pick-up. Macy's operate a no limit return policy, meaning there's no time limit on returns so long as they mean basic standards. For example items must be unworn or unused, and in their original brand new condition. You can return them free to your local Macy's store, or through the post at your own cost. Shipping costs can only be covered if you received items in error, or a damaged or defective condition. To initiate an online return simply follow the prompts from your order history. You will then be prompted to print a prepaid return label.